Since ancient times one of the most important articles of Uzbek traditional national clothes was a "Chapan" Robe. "The Chapan" has a very special value in tradition and culture of Central Asia people and in daily life as well. It was and still is very popular among Uzbek folk of any age. All Uzbek peoples wear robes on celebration and grand occasions (birthdays, weddings). The "Chapans" gifts are considered very valuable. They have an amazing variety and expressiveness of patterns. Any piece of them looks like a canvas painted by a refined colourist. Offered here is a stunning festive Uzbek robe-CHAPAN from Bukhara. 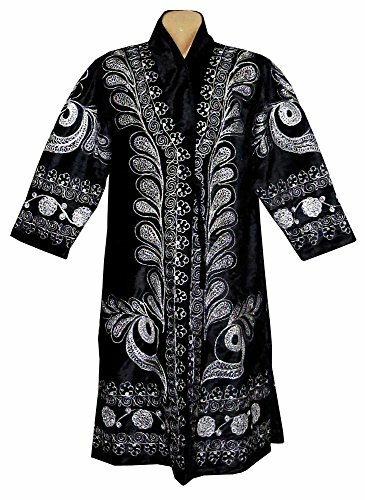 The top layer is black silk velvet decorated with graceful embroidery with silver & silk threads. Lined with natural cotton. The items are in the excellent condition. Never used. Size: length-43 in, chest-45 in, From the end of one sleeve up to another-57 in. length-109 cm, chest-114 cm, From the end of one sleeve up to another-144,5 cm. This item is offered with No Reserve, that allows to you feel free. I'll be glad to answer any questions. Also, if you win more than one item during a week I'll do combined shipping and you'll really save on shipping. Even if you just going to bid or already bid on some my items, please, email me about shipping discount. Please, let me know your size after purchase. Use my SIZE TABLE in the pictures. I have all from XS till XXXXL. Price is the same. Also, I can add a belt or pockets absolutely free. Thank you !! !